We look forward to welcoming over 15,000 spectators at some of the world’s most famous polo grounds including The Guards and Tidworth Polo Club. 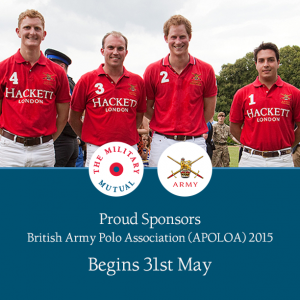 The Military Mutual will be supporting the British Army Polo Association (APOLOA) whose members in the past have included Prince Harry, Prince of Wales. We are proud to be part of this event which will aim to encourage, support and organise polo throughout the Army at all levels, widen its membership and increase the opportunities to play the game in order to build and develop teamwork and leadership. The Hackett London​ Rundle Cup, Tidworth Polo Club – Sat 11th July.